In an age of digital technology, smart phones are capturing millions of selfies every day. Social media posts contain innumerable images of human bodies and faces, all ‘tagged’ and labelled for the individual’s followers to find them in the morass of cyberspace. Not only are images produced at an astronomical rate, once they are available in cyberspace, they are freely copied, decontextualised and redistributed despite copyright warnings and restrictions. One cannot help but ask why artists are still trying to capture the human form in more traditional media such as painting, collage and even sculptural media, if the ease with which digital images are produced dominates and informs our visual culture. At the same time the emergence of cultural, gender and post-colonial studies have highlighted the need for acknowledging the wide diversity of cultures, different beliefs and customs, whilst simultaneously questioning the manner of representation of the body, which has traditionally been that of a biased and predominantly Western approach. Our fascination with capturing the human form stretches back to our record of the earliest artworks, dating back to prehistoric fertility fetishes. But it is really in the Renaissance that the depiction of the body takes on a superhuman quality which has set the tone for western art ever since. The perfect ‘universal man’ is exemplified by Leonardo Da Vinci’s Vitruvian Man, a perfect human specimen, fitting into a perfect geometrical space, existing in perfect harmony with God and nature. The body was often idealised and generalised. Not only did the Renaissance artist have to possess an excellent knowledge of human anatomy, but the artist also had to be adept at manipulating the body and perspective to accommodate the viewing angles of each work once created, often placed on ceilings or elevated recesses in basilicas or public buildings. Art, mathematics and perspective were the order of the day. As Vasari records, the Florentine painter Paolo Ucello (1396/7-1475) was so obsessed with perspective that it was rumoured that he stayed up most nights working out the vanishing points for his paintings, much to the dismay of his wife waiting for him to join her in bed. The ‘perfect’ man in his ‘perfect’ environment was the ideal to strive for. John-Michael Metelerkamp, Diamond, 2014. Acrylic on panel, 900 x 900 cm. Image courtesy of the Candice Berman Fine Art Gallery. With the invention of photography, visual depictions experienced a fundamental change which set the artist free from having to capture this perfect ‘reality,’ and has undeniably been the most radical influence on the representation of the body in contemporary art. One specific issue of relevance here is the ability of photography to frame and fragment the body. Many theorists such as Nicolas Mirzoeff and Linda Nochlin reason that the tendency to represent the body as fragmented is a postmodern symptom, reflecting the chaotic, disjointed and schizophrenic nature of contemporary life. Body parts are posed, contorted and exposed. Bodies are chopped, cropped into sections and presented as fleshy ‘objects’ which often deny the individual as a person. In this respect, the photographic works by Tamara James are apt examples. For instance, the work Clench presents the viewer with a pair of feet, detached from its body, and decontextualised. This all contributes to the visual ambiguity and poses the question as to whether these genderless feet are experiencing pain or pleasure. 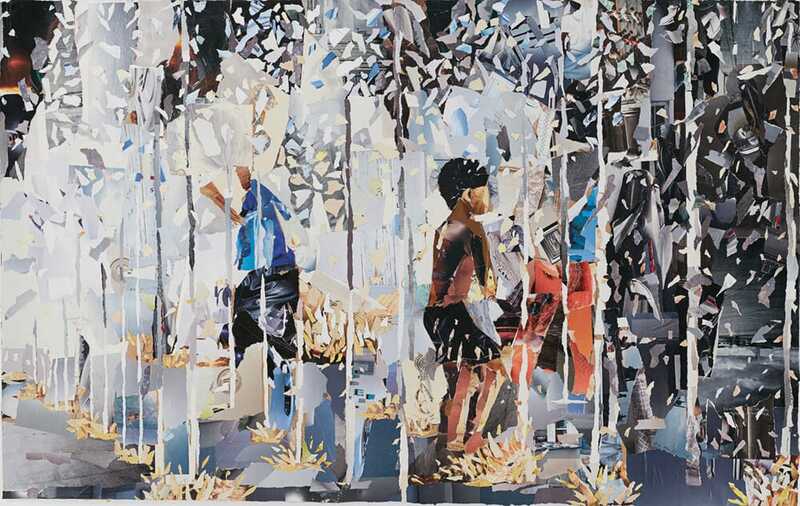 This fragmented approach can also be seen in the works of John Vusi Mfupi, whose artistic process depends on the reconstruction of the body using fragments, scraps of print media to form collaged images of daily life. The very act of constructing a portrait from the torn pieces of the physical media that promotes the products we consume daily, is a rather ironic comment on contemporary society. While his narratives are often clear, they deny the real identity of the people they are portraying, reducing them to products of the products they consume (or do not consume). Yet despite this, Mfupi still succeeds in capturing something of a personality, a snapshot of a personal narrative, while inadvertently acknowledging something of society’s obsession with posting digital images of ‘insignificant’ daily experiences on social media. Advertising, on the other hand, also raises questions regarding the representation of the idealised body. Much critique has been levelled against the advertising industry for their part in the portrayal of highly unrealistic representations of the body. Female figures are digitally manipulated into unrealistic organic form, the skinnier the better. The abnormalities are often only detected by the critical viewer who paused to think whether it is humanly possible for a model to have a waist size of a couple of centimetres. Most viewers automatically accept digitally manipulated images as the ‘truth.’ Using paint as medium, instead of photography could further comment on the representation of the body in this context. The viewer instinctively acknowledges that painting does not reflect ‘reality’ in the same manner as photography, and therefore one is far more accepting of incongruities in the visual representation of the body, in fact, viewers expect these to be present. The works by John-Michael Metelerkamp, such as the 2014 work entitled Diamond, could be viewed as a tongue-in-the-cheek comment on the physical limitations of body. In a way, these works also echo the approach by advertising companies to represent the female body as a highly sexualised object, with little or no regard for the physical properties of the human body. Metelerkamp’s paintings become comments on the absurdities associated with the contemporary representations of the body in a rather revealing manner. John Vusi Mfupi, Showers of Nature, 2015. Magazine collage on paper, 126 x 80 cm. Image courtesy of the Candice Berman Fine Art Gallery. Obviously, the issue of the representation of the body is a complex one, and highly debated. The examples mentioned raise further questions regarding the use of ‘traditional’ media over digital media. However, could it be (horror of horrors), that the modernist ideas regarding the role of artistic medium and practice still inform the way we approach ‘art’ despite all the attempts made to understand art within alternative spheres such as the institutional definition of art. In this light, we might consider the use of traditional artistic mediums as an attempt by artists to once again try and establish some kind of relevance in the world (and the artworld for that matter), and specifically in a world overrun by millions of instantaneous images, a world in which the significance of the representation of the body has been challenged on several levels. Tamara James, John Vusi Mpufi and John-Michael Metelerkamp are represented by the Candice Berman Gallery in Bryanston. Catherine Terblanche is an independent art historian, lecturer and curator.